Competition for college admission has sky-rocketed! The A+ College Prep Planner is the perfect guidebook for parents and college bound students in search of relevant information and help with applications. 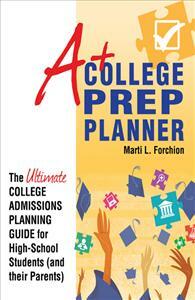 Preparing for college should begin long before the senior year of high school! The A+ College Prep Planner - The Ultimate College Admissions Planning Guide for High-School Students (and their Parents) was designed to make college planning easier for parents and students. This step-by-step guide focuses on each year of high-school and encourages 9th – 12th grade students to take an active role in their educational development and future plans to attend college. Parents of college-bound students will appreciate the easy-to-follow instructions, helpful hints, and useful worksheets designed to help students strategically prepare for and apply to college.